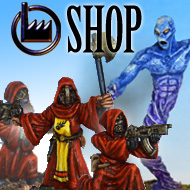 My next batch of sculpts are now ready for casting and are already in the post to Lancer miniatures. Here’s a quick preview of some of them – they should be appearing in their shop shortly. More previews coming soon. I have a bunch of the Foundry Darkest Africa tribesmen who are complaining about a housing shortage, and some thick card tubing which was part of the packaging in a set of saucepans prompted me to extract my digit and add to the one hut I made about 20 years ago! Traffic on this blog is frankly still a bit feeble. If you have a wargaming blog then please add me to your links and I will be happy to add a link back to yours. Just post the URL of your blog I the comments below.